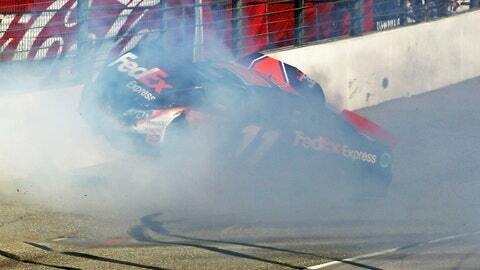 Denny Hamlin (11) hits the wall hard at Auto Club Speedway on March 24. It was another wild and crazy year in the NASCAR Sprint Cup Series, with 17 different winners, plenty of close finishes, a new car and lots of unforeseen happenings. Here’s 10 people and performances that stood out in the just-concluded Cup season. 10. 13TH MAN AWARD: JEFF GORDON — When Gordon was added to the Chase to the Sprint Cup field at the last moment, some observers thought it was a bad move on NASCAR’s part. But Gordon proved he belonged with a victory at Martinsville and a sixth-place points finish. 9. THE FIRST ONE NOW SHALL LATER BE LAST: CARL EDWARDS — Two years ago, Carl Edwards finished tied for first in points but lost to Tony Stewart on a tiebreaker. This year, Edwards led the regular season points standings but finished 13th in points, last among the Chase drivers. 8. BEST CAREER SAVE: KURT BUSCH — In a one-and-done deal with Furniture Row Racing that benefitted both sides tremendously, Kurt Busch re-established himself as a championship-caliber driver. And his volunteer and philanthropic work off the track with soldiers was tremendous. 7. BIGGEST UPSET: FRONT ROW MOTORSPORTS — If you bet an exacta of David Ragan and David Gilliland going 1-2 in the spring Talladega race, hope you bought a Power Ball ticket afterward. No one else saw that coming. 6. MOST DISTURBING TREND: INJURIES — Despite NASCAR being safer than ever, too many drivers got hurt this year: Denny Hamlin broke his back in a head-on crash at Auto Club Speedway, Martin Truex Jr. broke his wrist at Bristol and Brian Vickers severely sprained his foot at Bristol. An immobilizing boot Vickers’ wore caused a recurrence of blood clots in his leg. But the most horrifying crash was Tony Stewart’s sprint car wreck in Iowa that gave him a double compound fracture of the right leg. 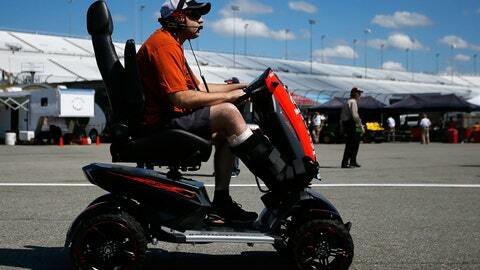 Tony Stewart, nursing a broken leg, sits on his scooter in the garage area at Richmond International Raceway. 5. PERSONAL BESTS — Kyle Busch finished fourth in points, for his best result in the Sprint Cup Series, while former teammate Joey Logano made the Chase for the first time and ended his first season with Penske Racing eighth in points. Dale Earnhardt Jr. failed to win a race but wound up fifth in points, his best result since joining Hendrick Motorsports in 2008. 4. SLEEPING WITH THE ENEMY: STENICA — Think about it: The two NASCAR Sprint Cup Rookie of the Year combatants were lovers, something that’s almost certainly never happened before. 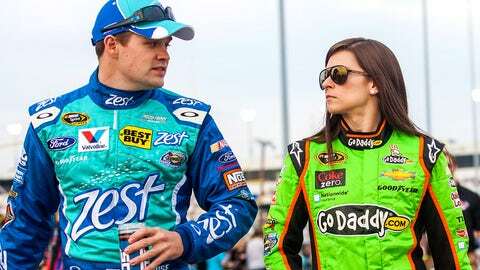 At any rate, Ricky Stenhouse Jr. took the rookie honors comfortably over Danica Patrick. That led the Associated Press to issue the following spectacularly ill-conceived headline: "Stenhouse beats girlfriend for top rookie title." 3. NO LAME IN HIS GAME: KEVIN HARVICK — The conventional wisdom was that lame duck Kevin Harvick would struggle in his final season with Richard Childress Racing. The conventional wisdom was dead wrong, as Harvick won four races and finished a close third in points. 2. SILLY SEASON MOVE OF THE YEAR: MATT KENSETH — The move from Roush Fenway Racing to Joe Gibbs Racing proved highly lucrative in more than one way for Kenseth, who won a career-high seven races and finished second in points. 1. MEET THE NEW BOSS, SAME AS THE OLD BOSS: JIMMIE JOHNSON — New car, new competition, a lot of new crew guys, same ending: Congratulations to Jimmie Johnson, crew chief Chad Knaus and the entire No. 48 team for becoming only the third team in history to win six NASCAR Sprint Cup championships.